In April 2010, I interviewed a Tibetan monk named Yidam Kyap as part of the Tibet Oral History Project that documents the life stories of Tibetan elders living in exile. The main aim of the project is to explore what life was like in Tibet for Tibetans from all walks of life before China's takeover in 1959. Yidam was then 67 years of age and passed his days at an old age home run by Drepung Gomang Monastery, near the town of Mundgod in the South Indian state of Karnataka. He was extremely self-contained, but I noticed that he watched our camera crew setting up with a kind of charged anticipation. As we talked, it became clear that his was a very special story. Told from the perspective of a teenage monk, it is cinematic, heart-breaking, gripping -- and one that challenges any number of rather precious ideas about Tibet and its people. Yidam Kyap was part of what was almost certainly the largest single group to escape into exile from the embattled eastern regions of Tibet in 1959. A rag tag civilian resistance unit of two hundred men, women, children, monks, yaks and horses, made the three thousand mile epic flight across the plateau to the Nepal border. The group, from Zachukha and Tawu, was led by two extraordinary men; the courageous and brilliant strategist, Bachung Nyalo, and the patriotic monk-aristocrat, Gunda Tenzin. They had 33 encounters with the soldiers of China's People's Liberation Army in the year that it took them, and survived them all, dodged spies and informants, and endured extreme food shortages and arctic climates with a combination of foresight, discipline and a dash of Buddhist wizardry. All but three made it out alive. Here is part one of his two part story. Yidam Kyap grew up in a bucolic mountain valley of Eastern Tibet, the peaceful beauty of which belies the region's troubled history. Even today, a Google search of his township, Tawu (Ch. Daofu), offers little apart from horrific photographs of two Tibetans who died after setting themselves on fire last year; a 29-year-old monk named Tsewang Norbu who drank petrol and put a match to himself in front of a government building, and a 35-year-old nun, Palden Choetso, who burned herself to death near her nunnery. Both called out for freedom and the return of the Dalai Lama as they were burning. In March this year, a 27-year-old Tibetan man, originally from Tawu, self-immolated in New Delhi during the visit of China's president Hu Jintao. Yidam Kyap was born in 1943 in a village in modern-day Kardze (Ch. Ganzi) prefecture in the rugged mountainous region of Kham, that has been absorbed into China's Sichuan province. Tibetans of Kardze have a reputation for stubborn defiance of China's rule and a proud assertion of their distinctive Tibetan-ness. Not surprisingly, it was one of the most restive areas during the 2008 uprising. When he was nine years old, Yidam's mother sent him to be ordained as a monk. His father was the village chieftain and the Chinese Communists, who were courting Tibetan leaders at the time, tried to recruit him to carry out Mao's experimental socioeconomic policies that would anticipate those of the Great Leap Forward. Ultimately, their efforts to win him over failed. In the Winter of 1955, while Yidam was studying at Taklung Monastery, his whole life and the lives of everyone he knew changed forever when the methods of the Chinese reformists went from persuasion and coercion to outright force. "The Chinese waged a war on us", he says simply. When soldiers set up artillery on the roof of his monastery, the message couldn't have been more clear. In this tense and volatile atmosphere, Yidam fled with all 1,000 of his fellow monks. * Yidam's older half brother, also a monk, sent word for the twelve-year-old Yidam to come and join the resistance unit that their father was now leading. Yidam's father was not a religious man, but he had drawn the line at leading his people in the demolition of the local monasteries. When he was directly ordered to do so by the Chinese authorities, he "grabbed his gun and rode up into the mountains". Three monasteries in the Tawu region were completely destroyed, recalls Yidam. Their assets, such as gold and silver religious statues, were confiscated and stored in a residential home guarded by Chinese soldiers. Yidam's father surrounded the house at night with a small fighting unit and ambushed the guards. He then sent a message to the monks hiding in the hills to come and reclaim the property of their respective monasteries. Yidam's father was responsible for over one thousand monks, lay men, women and soldiers. They lived rough in mountain camps that for over two years were the bases for raids on Chinese occupied Tawu, and formed part of the region-wide Khampa revolt. Like most Khampa boys, Yidam knew how to use a gun, but being a monk he was not required to fight, and kept occupied tending to the horses and yaks. Although, as will be seen later, some monks did take up arms during this period of Tibet's history, their involvement was generally discouraged by lay Tibetans. While feeling great admiration for the courage of the Tibetan resistance fighters, Yidam was relieved that his monk's robes protected him from combat, having no desire to prove himself to be 'his father's son'. Yidam describes his father as "a great sinner" who "loved to fight in the war" and who "killed many Chinese." From Yidam's account, his father's resistance unit was fairly well armed. He measures the quality of the guns against the trading price of horses and yaks. Each gun in his unit cost between forty and fifty animals, which was "very good quality". Kham was known for bandits and blood feuds and guns were needed for hunting and to defend against wild animals. When the People's Liberation Army began their offensive, guns were the final denominator. "Those that owned guns were fighting and those that did not were fleeing." A turning point in Yidam's fortune occurred in the summer of 1959, with a major battle in the neighboring county of Serta. The Tibetan capital of Lhasa had already fallen, and unbeknownst to Yidam and his comrades, the Dalai Lama had been given political asylum in India. In Serta, three Tibetan divisions joined forces to fight the PLA. Two of the divisions, including the one led by Yidam's father, were "annihilated". The survivors of the remaining one, around one hundred people, were from Tawu, led by a charismatic monk known as Tawu Gundatsang or Gunda Tenzin. Gunda Tenzin's brother had been the village leader before he was killed fighting the Communists. Even though it violated his monastic vows, Gunda Tenzin gave in to the pleas of the villagers to take over from his brother, since he was part of the ruling clan. 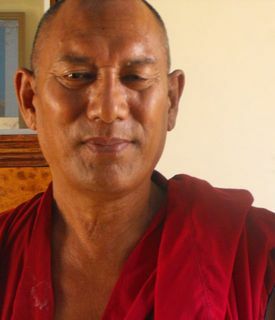 Yidam says that Gunda Tenzin had been "a very good monk". But he also turned out to be a very good soldier--and one of the reasons Yidam is alive today. Captured in the heat of battle after he ran out of bullets, Yidam's father together with Yidam was taken to a detention camp, and executed a few days later. At this point in his story, Yidam lifts his finger to the centre of his forehead and pulls an imaginary trigger to indicate how it was done. Other Tibetan leaders suffered the same fate. Their bodies, along with the body of his father, were taken to a fort and strung up for public viewing. Yidam was among those made to watch. "Look at your leaders," said the cadres pointing to the hanging corpses. "If you revolt against Communist China, this is the only way you can expect to go." The Tibetans who weren't killed, said Yidam, were forced to work on collective farms. Yidam's mother was among them. He never saw her again. Perhaps because he was so young and unassuming, Yidam didn't draw much attention. When he spied an untied horse that had belonged to one of the captured Tibetan fighters, he acted fast. Before anyone could stop him, he leaped up onto the saddle and bolted away. "The Chinese kept firing. My horse was killed right under me." Yidam continued his escape on foot, running as fast as his legs would take him, and then -- "I sensed something behind me. When I turned to look a horse was galloping right towards me with a dead rider on its back." Sparing no time, Yidam pulled off the body, mounted the horse, and took off to find his brother. Once reunited with his older brother and his brother's lama, the three monks traveled slowly westward, dodging Chinese army units. After three days, exhausted and hungry, they stumbled upon the survivors of the Tawu unit, led by the fighting monk, Gunda Tenzin, and fell in with them. At Zachukha, they met up with another group of Tibetan fighters led by a layman named Bachung Nyalo, whom Yidam describes as "extremely courageous and clever." The two units joined forces making two hundred people in all. Fifteen of them were women and children. Yidam was one of seven monks. With the exception of Gunda Tenzin, none of the monks took up arms. Even if they had wanted to, Yidam says, the leaders would not have allowed it, as the role of monastics was highly respected among the people. But during the journey, Yidam remembers often overhearing the same conversation between Gunda Tenzin and a senior monk. It would go something like this. "Rinpoche [term of respect] there can't be any sin in killing Chinese, right?" "It is a sin since they are humans and you are killing them. That is a sin." "Of course, killing humans is sinful but the Chinese are the enemies and destroyers of the Buddha Dharma [the Buddha's teachings]. Killing them cannot be a sin." "Gunda Tenzin was a monk but he never accepted that killing Chinese was sinful," says Yidam. It's the first time during the recounting of his story that he laughs. I pressed him for his opinion on the matter. "I think that there must be sin in killing Chinese. However, everything depends on your mind. For example, if His Holiness the Dalai Lama was walking down a road, and if a Chinese person pursued him in order to capture him, and if you succeeded in stopping that person by killing him and His Holiness succeeded in escaping, then that is something extraordinary. So, definitely I think there is a difference; though it's hard to say that there is no sin at all. However..." Yidam trails off, apparently content to leave the question unresolved. I asked him if he thought that it was possible to destroy the Buddha Dharma with guns. "It looks like that is happening, when lamas and monks are not allowed to live in the monasteries" he says, referring to the present restrictions on monks in Tibet. The Buddha Dharma is based onlung [energy] and tokpa [transmission of insights]. Just having some images and scriptures around does not mean that is the Buddha Dharma. If lamas and monks are destroyed, that is destroying the Buddha Dharma." Knowing that they would need to cross the formidable Drichu river (called the Yangtse in China), Bachung Nyalo had the foresight to bring with him a coracle, an animal skin boat stretched over a wooden frame. It was summer, and the river was in spate from the snow melt, and so thunderous that "you couldn't hear someone shout from the other side." Only two people among the two hundred knew how to row, so they took it in turns to ferry the others across. As the coracle could only hold a maximum of ten people, progress was painfully slow. For seven days they rowed back and forth across the raging Drichu, with those still left waiting on the eastern bank anxiously expecting Chinese soldiers to ambush them any moment. But all two hundred made it safely across. "We were very fortunate." Yidam leans forward slightly. "Had they come during that time, we would have been finished." It's something that he says time and again, with each almost miraculous stroke of fortune along the journey. The group carried on northwards following the west bank of the Drichu. "It was summertime," recalls Yidam. "The area was beautiful with grasses and flowers." At one point they came across thirteen Tibetans, whom Yidam believes were informants working for the Chinese, scouting for people attempting to escape the country. Bachung Nyalo and Gunda Tenzin ordered their capture, but then offered them a place in the group. They told them "It's better for you to come with us. You will be happy if we are happy, and you will reach wherever we reach." But the thirteen declined, arguing that they couldn't leave their wives and children behind. Yidam explains that every Tibetan they met was assumed to be a spy, but that they always offered everyone they captured the chance to join their escape. If they refused, they would take them along with them for a few weeks, then leave them in unfamiliar territory so it would be harder for them to report back to their superiors. When the leaders felt they were too exposed, the Tawu-Zachukha group traveled only at night, sleeping in pits dug into the riverbank during the day. "To get food we plundered like bandits. The Chinese had set up communes all over Tibet, where they kept all the assets and properties that had once belonged to people; horses, cattle, every animal. No one was allowed to say: 'this is your property' or 'this is my property'. Everything belonged to the commune. We raided these communes, stealing horses or anything we needed. We looted from the Chinese." Yidam chuckles at the irony. One day they spotted a large group of people walking some distance away. "We assumed they were Chinese. Our leaders told some of the armed men to go and check." As they advanced they raised the Chinese national flag. The mystery group raised the same flags in response. "They told us that every Sunday some soldiers came in a boat to collect the droma. Poor things," Yidam shakes his head, "they told us everything truthfully." Asked when the Chinese were coming, they answered "Xingshri." "We asked 'What is Xingshri?'" and they said it was the Chinese word for Sunday. "Having no idea what day of the week it was, we asked them, "When is Xingshri?" and they replied, "Tomorrow." They had few animals left by that point as they had been killing them for food. But that night they slaughtered one of the yaks for the new arrivals and "fed them to their heart's content." But they weren't taking any chances, and at night, guards were posted to watch them in case they tried to escape. Yidam explains that Bachung Nyalo set up a strict system of two hour shifts among the men for guarding the camp whenever the group stopped to sleep. If there were hills around the camp, two men were assigned to keep watch on each hill top. "Our security was really tight," he says proudly. "Our leaders told the young women, 'Tomorrow you must go to the river bank and hold up the red flag to show the Chinese that they can come without any suspicion. The Communist Chinese are our enemies and we will kill them. But you will not be harmed in any way." Early the next morning, ten sharp shooters went with the two girls to the bank of the Drichu. They dug sand pits and lay down in them, rifles aimed across the river. The two girls stood close by, waving the flags to signal to the Chinese soldiers that the coast was clear. After only a few minutes, about ten Chinese soldiers appeared on the opposite bank and began making their way across in a coracle. Just before they reached the other side, the two girls, overcome with anxiety, jumped into the river. "They had betrayed the Chinese and they knew there was nothing but death ahead for them," Yidam explains. The current took them quickly. At this the soldiers became suspicious, but before they could fathom what was happening, the Tibetans opened fire. "I later heard that the sides of the boat were red with blood." All the soldiers were killed, their weapons seized and their bodies dumped in the river. When the group returned to the camp and recounted the events, the rest of the droma-gatherers "were filled with terror." The two leaders told them, "It is no use for you to stay back. You will not find food and the Chinese will not treat you well. Come with us. We are together in good times and bad. Those that do not own a horse will be given a horse. Those who do not have anything to eat will be fed. Those without clothing will be clothed. Our group is like one family. Wherever we escape to, you shall reach there with us." But they shook their heads, saying, "The whole of Tibet is filled with Chinese. There is nowhere to go." They would not come with us. We could not tarry and set off at once. That was it." Yidam Kyap pauses for a moment. I imagine he's remembering those twenty boys and wondering what became of them. He was not much younger than them at the time. His party was left with no choice but to leave them behind. They gave them as much food as they could spare and continued the journey north. It was true that the odds were not in their favour. They were an unwieldy group; large, slow-moving, easy to spot, with limited arms and supplies and two hundred mouths to feed. They survived or died on their own wits. "No one helped us," says Yidam flatly. They also had a distance of over three thousand miles of Chinese-controlled territory to cover, one third of which would take them in the dead of Winter across one of the most inhospitable and least explored regions on earth--the Changthang. *The 12th century Taklung monastery was later destroyed during the Cultural Revolution, rebuilt in the 80s and then collapsed in the Yushu earthquake of 2010. **This was during the time of Mao's Great Leap Forward, an attempt to transform China from an agrarian to industrial economy through collectivization. Regarded as a spectacular failure even by the Chinese Communist Party, it is considered the cause of the worst famine in world history, with conservative estimates in the range of 30 million deaths. Tibet was hit particularly hard, with perhaps one in five dying of starvation from 1959 to 1962. Jones, Adam (2010). Genocide: A Comprehensive Introduction. Routledge, 2nd edition. NOTE-- Rebecca Novick has conducted hundreds of interviews with exiled Tibetans, particularly with elders, exploring their experiences and life histories. She has written and edited six books on Tibetan Buddhism and culture, and has produced and edited numerous radio documentaries. Before founding The Tibet Connection, radio program, she co-hosted and produced the weekly radio show Experience Talks. The story is lovely, how can I reach to the author?